Silly Bee's Chickadees: Silly Bee's Beauty- Kiss My Nails! Silly Bee's Beauty- Kiss My Nails! If you're looking for a quick, inexpensive way to fancify your nails for an evening out and hate how acrylics tear up your nails, this tutorial is for you! I needed to pretty my hands for a charity ball, so I went the DIY route and they came out great! When I was in high school, I had great nails--very strong, always polished. Since then, I haven't, mostly because I pick at them and never let them grow. My thumbs are especially bad and I hide them as best I can. (Notice how I cropped my thumb out of my "before" picture.) I've even caught myself with my thumbs tucked into fists so no one can see them. I know-- how very, very sad. I finally decided to do something about it and the charity ball was my incentive. 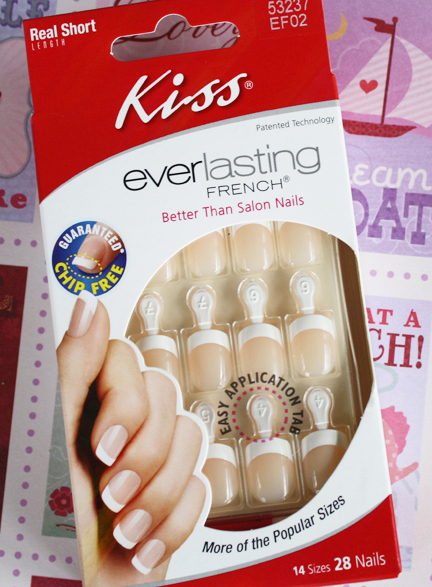 Enter Kiss Everlasting French Nails. They last seven days and are easy to apply and remove. What I love about them is that they are natural-looking, not bright pink and black-light white like these or an inch thick like these. I liked them so much that I applied another set a week after I removed the first and it was just enough time to let my little nails grow enough so I didn't have to hold my hands in fists anymore! Everlasting Nails come in two lengths: Real Short and Medium, and three types: Regular, Square and Petite. Kiss also has Feather Light Nails and Custom Fit Nails for flat nails. Mine are the regular ones in Real Short. The kit included 28 nails with handy little tabs, nail glue, a wood cuticle stick and a mini nail file. For best application, you'll also need plain polish remover (no moisturizers) or rubbing alcohol, cuticle lotion or oil, cotton balls and a paper plate for protecting your dining table! And, away we go! First, lay out all the little nails in order by size and fit them to your own (those are mine in the picture above). Take your time making sure the nails fit well. If they don't, they may snag on stuff and pop off too soon. Also, if you've forced a nail on with a higher arch than yours, they will lift your real nail from the nail bed and HURT and that's no good. Trust me. Once you've picked the winners, line them up separating the right and left hand so they don't get mixed up. Put all the losers back in the package so you don't cause more confusion. It only takes one swipe of your sleeve to scatter them all about and that's no good. Trust me. Next, prepare your nails. Put a bit of lotion, vitamin oil or cuticle softener on your cuticles and use the flat angled end of the cuticle pusher to push them back. Wash your hands, then clean your nails with polish remover or rubbing alcohol to remove any traces of oil. Before you glue each nail on, double check the size. If the nail is too rounded on the top where it meets your cuticle, you can file it down for a perfect fit. 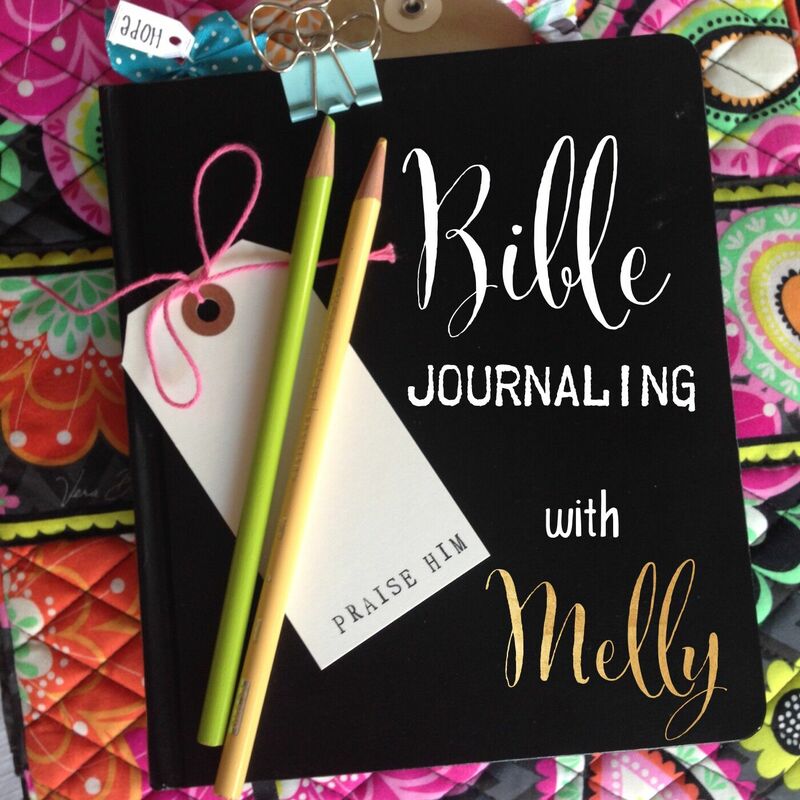 Now, you're ready to start gluing! I suggest you start by applying nails to your dominant hand. If you're a righty like me, it's a lot more difficult applying nails with your left hand if you already have fake nails on. Put a couple dots of glue on the fake nail and spread it around with the tip of the glue nozzle. Do the same to your own nails. Make sure you have glue all the way to the edges or they may lift and catch on stuff and that's no good. Trust me. 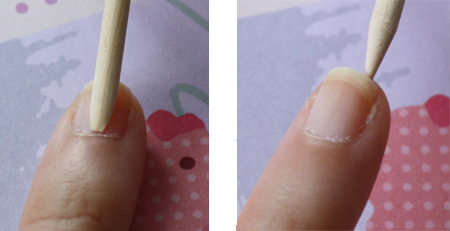 Hold the nail by the little tab, place it at the cuticle first, gently lay it down and hold it for a few seconds. That way, the excess glue will come from the bottom of the nail and not all over your cuticle and that, too, is no good. Trust me. If you see white spots on your nails, those are air bubbles. Aside from just looking bad, they can make your nails pop off. So, if you do end up with air bubbles, I suggest taking the nail off with an acetone-based remover and trying again. Finally, gently bend the tab back and forth until it breaks off and use the file to touch up the little spot the tab left behind. 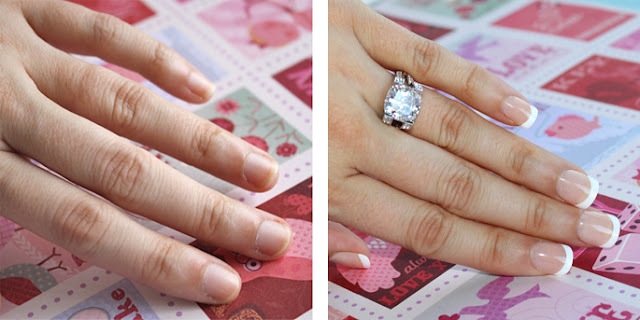 If you have any glue on the top of your nails, file down any bumps and put on a coat of clear polish on top. You can also file down the length of the nails if you'd like. After wearing mine for a few hours, I decided they were too long, so that's what I did. Don't forget to carry your glue and nails in your purse just in case one of the nails pops off. If you can't find the little bugger, grab a leftover nail that's a tad bigger than yours and file the sides down to fit. Kiss recommends that you remove them after one week which is easy to do with those acetone polish remover containers with the sponge in them. Just whatever you do, don't yank them off! P.S. It's a cubic zirconium. Gotcha! Silly Bee's Beauty- Vote for my Nails!